Looking to Sell Your American Paintings in CT, NY & Now AZ? Have you decided to sell some of your American paintings? Generally, while they may not be as old as artwork from other countries, works by the American masters can still be worth a nice amount of money. As one of the Premiere American art buyers & appraisers in the country, we’re here to make certain you receive the right amount of money for your artwork. If you don’t have a buyer lined up, we may even want to purchase the piece ourselves for one of our many American art auctions. Who Buys American Art in New York, Connecticut & Now Arizona? There are many people out there interested in purchasing American art. If you have American Art & Painting but aren’t sure where to sell them for the best price, then we are here to help. In addition to American art collectors, some homeowners purchase a few pieces to decorate their homes. Museums and other organizations also occasionally purchase new artwork by well-known Americans. We want to help you determine just how much your piece is actually value before you sell it, either to us at the best prices OR just for getting an artwork valued. There are even some who are interested in artists who aren’t famous, but were born or grew up in certain areas. In the event you do sell to us, we also offer services for brokering and consignment. We, also work to host our own American art auctions to ensure that the right painting finds its way to the right person. We have over 40 years of experience in buying American Art & other antiques also in New York, Connecticut & Now Arizona. 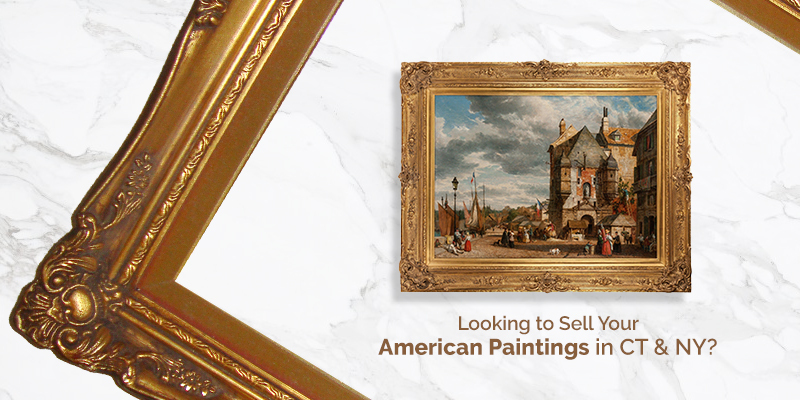 Sell Your American Painting for its true worth in Connecticut, New York & Now Arizona Area. Before you sell your artwork, you want to make certain you know what it’s worth. Whether you need a specialist in 20th century art appraisal or someone who knows modern art, we’re here for you. Before we buy American art, our expert appraisers examine every inch of the painting, determining factors such as its authenticity, its condition, and the demand for the piece. It doesn’t matter what condition it’s in or if it’s by someone well-known or not, we can provide you with a value and offer the best prices for all American art. We look at a number of factors when appraising your American art. The artist is, of course, one of the most important factors. In some cases, a damaged work by a famous artist is worth much more than a pristine piece by someone who isn’t as popular. Condition, rarity, the time period in which the piece was painted, and even whether or not the artist signed the painting all play into the value. If you are looking “Where to Sell American Art & Paintings in New York, Connecticut & Now Arizona”? Then you are at right place. We have over 40 years of experience in buying and appraisal services.